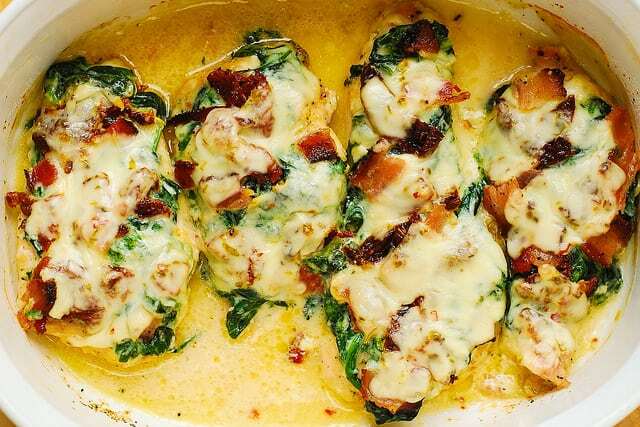 Sun-Dried Tomato, Spinach, and Bacon Chicken recipe – the chicken breasts are seasoned with dry Italian salad dressing mix, smothered with the creamed spinach, sun-dried tomatoes and bacon, and baked to perfection! The best baked chicken ever! If you want to know how to cook the best chicken breasts, this is the recipe for you! No more boring, dry chicken. A lot of people prefer to bake their chicken vs. frying it on the stove top, and in this recipe the chicken breasts are baked in the oven and are very juicy and moist and flavorful thanks to all the stuff on top! 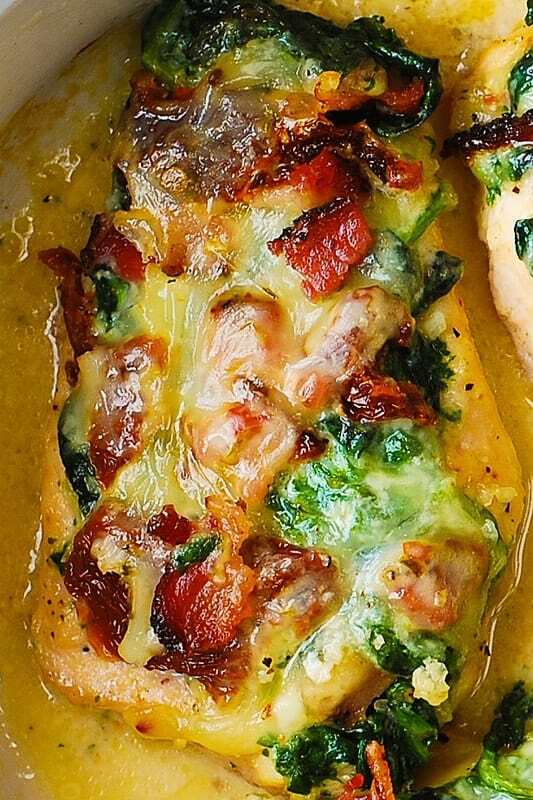 This Sun-Dried Tomato, Spinach, and Bacon Smothered Chicken is one of the best chicken breast recipes I ever made! 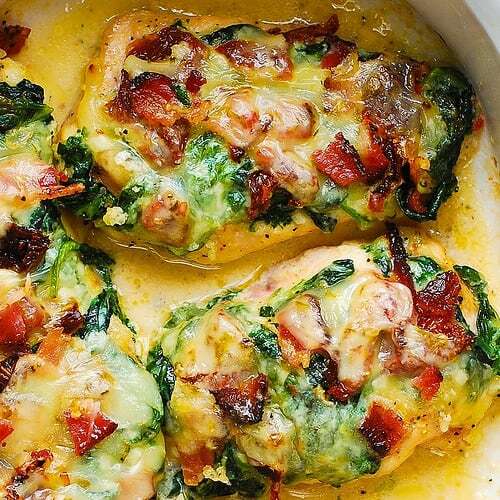 It’s just like stuffed chicken, instead you put everything on top and bake! 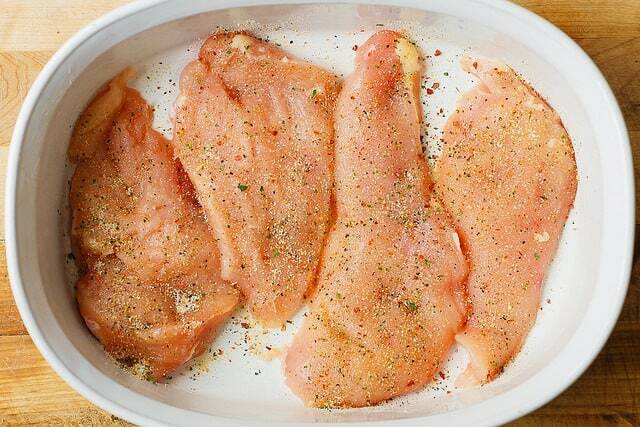 Preheat the oven to 375 F. Use 4 small chicken breasts or 2 large chicken breast, sliced horizontally in half. Butter the bottom of the baking dish. Season chicken breasts from both sides with the Italian salad dressing mix. 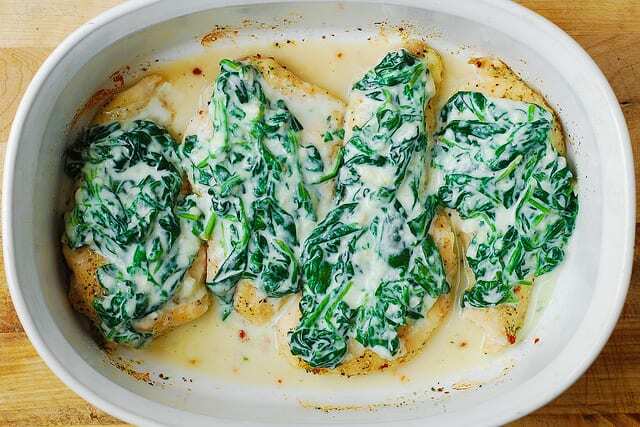 Place the chicken breasts, flat side down, into the greased baking dish and bake for 15-20 minutes at 375 F.
In the mean time, make the creamed spinach. Heat 1 tablespoon vegetable oil in a large skillet on medium heat. Add spinach and cook for only 1 or 2 minutes until it is heated through and starts to wilt. Remove from heat. Add minced garlic and half and half. Bring to boil. Add shredded mozzarella cheese and keep stirring, on high heat, until mozzarella cheese starts to melt – about 30 seconds. 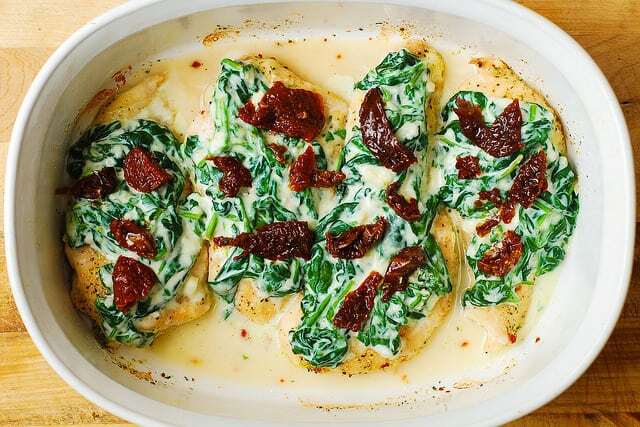 Reduce heat to simmer and keep stirring until you have a nice, smooth creamed spinach – about 30 seconds or 1 more minutes. 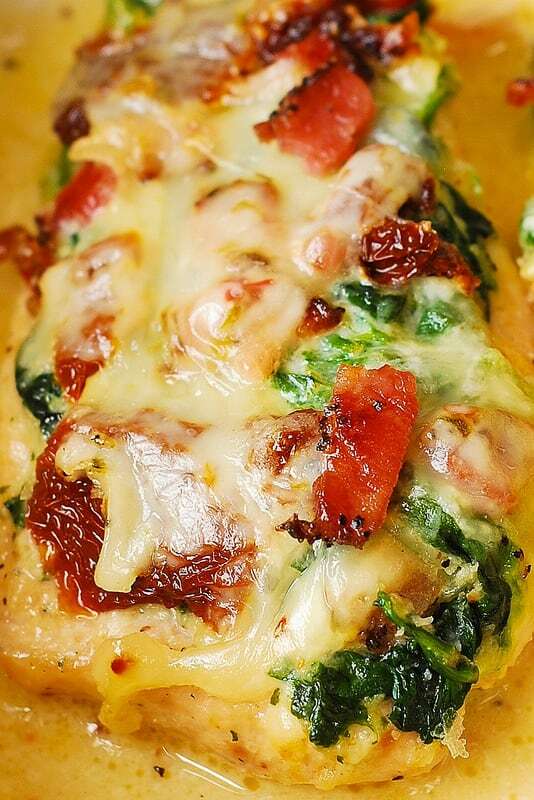 The creamed spinach should be pretty thick in texture, not watery. If watery, bring to boil again and cook off extra liquid, constantly stirring. Season with salt. Remove from heat. Next, top with the broken slices of pepper jack cheese. These are really some of the best baked chicken breasts I ever made! 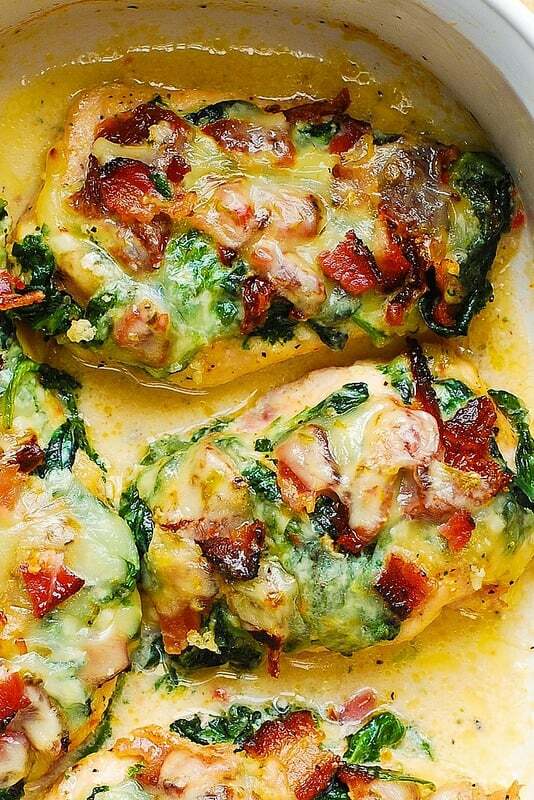 One of the best baked chicken breast recipes ever! 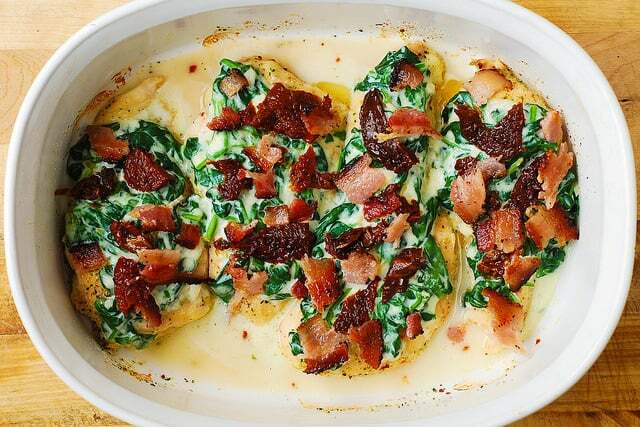 Chicken breasts are smothered with creamed spinach, sun-dried tomatoes, and bacon, and then baked in the oven. Tender, moist, flavorful chicken. No more boring chicken breasts! In the mean time, heat 1 tablespoon vegetable oil in a large skillet on medium heat. Add spinach and cook for only 1 or 2 minutes until it is heated through and starts to wilt. Remove from heat. Add minced garlic and half and half. Bring to boil. Add shredded mozzarella cheese and keep stirring, on high heat, until mozzarella cheese starts to melt - about 30 seconds. 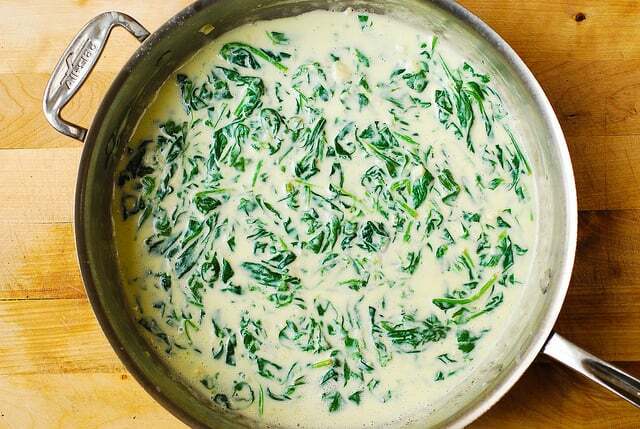 Reduce heat to simmer and keep stirring until you have a nice, smooth creamed spinach - about 30 seconds or 1 more minutes. The creamed spinach should be pretty thick in texture, not watery. If watery, bring to boil again and cook off extra liquid, constantly stirring. Season with salt. Remove from heat. 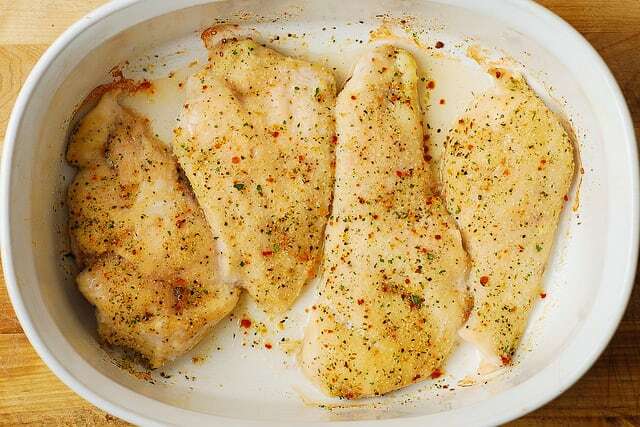 Remove the baking pan with chicken breasts from the oven (you baked them for 15-20 minutes). 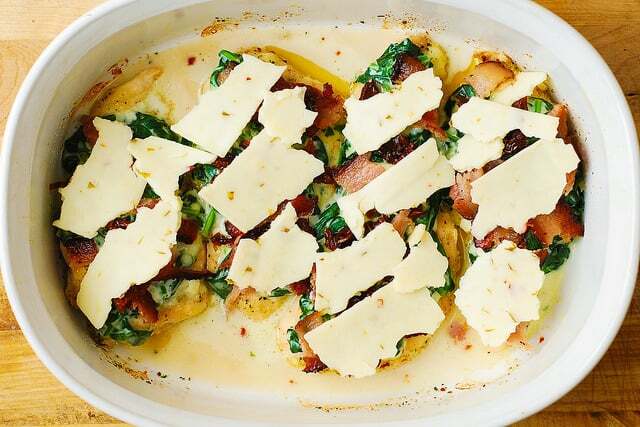 Top each chicken breast with creamed spinach, sun-dried tomatoes (drained from oil and chopped into smaller bites), chopped cooked bacon, and broken slices of pepper jack cheese. Bake in the oven, uncovered for 15-20 more minutes, until the chicken is completely cooked through, no longer pink in the center, and the juices run clear. I don’t usually cook spinach I really don’t like it at all lol, but the pics looked so good I had to try!!!! Turned Out amazing!!!! The whole family loved it! Easy to make, great directions, awesome all the way around, if you are like me and don’t try new stuff very often, I honestly advise this as something to try!! Thank you for such a nice comment! It made my day! I am so happy you enjoyed this recipe. What side dish are good with this? Or just leave it like it is?I’m cooking this tonight. At my local grocery store they didn’t have italian dry mix. What else can I use? 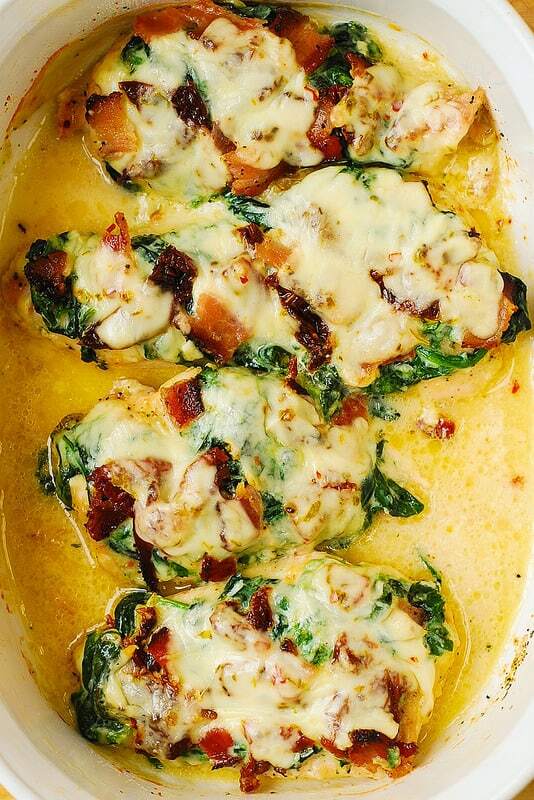 Serve this with rice, roasted asparagus. Flavored rice would be great. Or angle hair pasta tossed in olive oil and garlic. I JUST made this and it is the best dinner we’ve had in a long time! So so so so good! Thanks for sharing a great new dinner that will definitely be in rotation at our house! 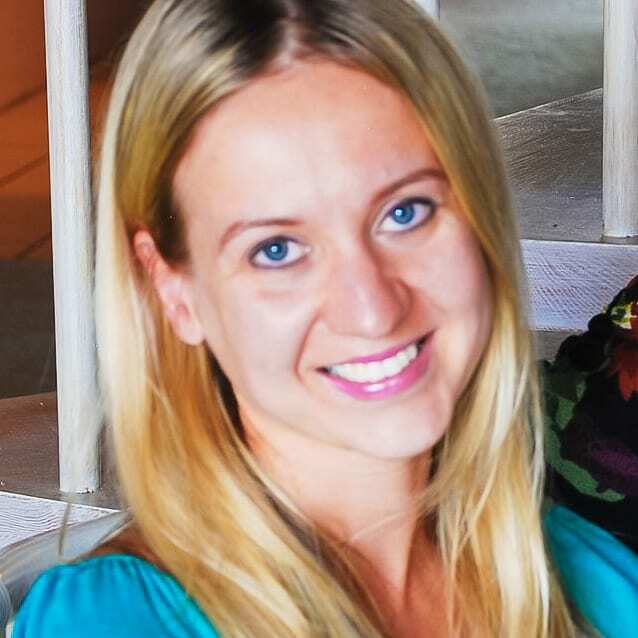 Katie, I am so happy to hear that! Comments like yours make my day. Thank you! Super delicious recipe. I actually made with thin chicken breasts and it was sooo good. This is a keeper.